Horizontal Mirroring mirrors all pieces along the vertical axis between the D- and E-File. 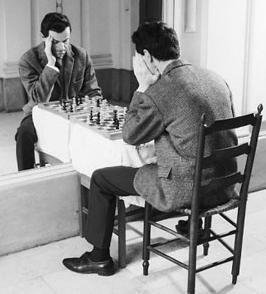 Applicable if both sides have lost their castling rights, horizontal mirroring should result in equal static evaluation score, but not necessarily equal search result if pieces and squares are traversed in different order. Along with vertical flipping and/or diagonal mirroring, horizontal mirroring is used in pawn-less endgame tablebases to restrict a white king to the 10 squares of the a1-d4-d1 triangle of the board. Vertical flipping and horizontal mirroring (or vice versa) results in rotation by 180 degrees. This page was last edited on 18 December 2018, at 22:17.